Midtown Comics have unveiled two variant covers and solicitation for Mega Man #42, featuring the second part of the Mega Man 3 story arc. 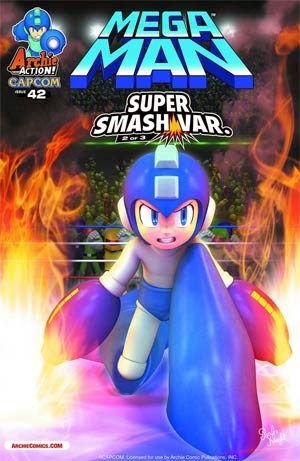 As you can see above, the cover on the left features traditional art from Patrick Spaziante, while the cover on the right is part 2 of a 3-part "SUPER SMASH" collector sets. Solicitation: The battle rages on! Based on the legendary game Mega Man 3 comes 'Legends of the Blue Bomber,' Part Two. We've seen Mega Man battle Robot Masters before, but now see the fight unfold from the perspectives of the villainous robot adversaries themselves! Shadow Man recalls his humble beginnings and how they brought him to his deadly duel with Mega Man! Gemini Man is ready to ambush our hero with his hologram copies! But while the battle rages on, Break Man is behind the scenes on a mission of his own - why is he hunting down Dr. Wily's first set of Robot Masters? Featuring all-new cover art from Patrick 'SPAZ' Spaziante, and part 2 of a 3-part connecting 'SUPER SMASH' collector cover set! To complete the Super Smash Bros. cover set, be sure to pick up Sonic the Hedgehog #266 and Sonic Universe #69. This sounds promising! The biggest flaw many fans had with the comic at the beginning, was the pacing of the battles. Instead of a suspenseful full-fledged fight to the death with fan-fave Robot Masters, the battles were so miniscule that a cameo appearance could've been more appropriate. 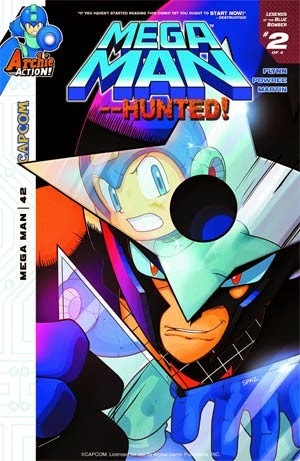 I hope that this Mega Man 3 saga carries on a bit further than Mega Man 1 & 2 did. Also, Mega Man 3 is my favorite classic game, so I'm not going to go lightly on criticism. If something is portrayed in a manner that's worse than the game, then I'll be quick to point it out. I have faith in these guys, though. Don't blow it now!